We offer Thera-Band products in the office because they are cheap and simple, but offer you many powerful ways to teach your body to regain perfect posture. When Dr. Khoury prescribes one of these exercises for you, scroll down to find the one he specified, and perform the exercise for as many sets and reps as he wrote down. Rest as long as you need between sets. If any movement causes you pain, then stop that movement and let Dr. Khoury know! Place middle of band around back of head. 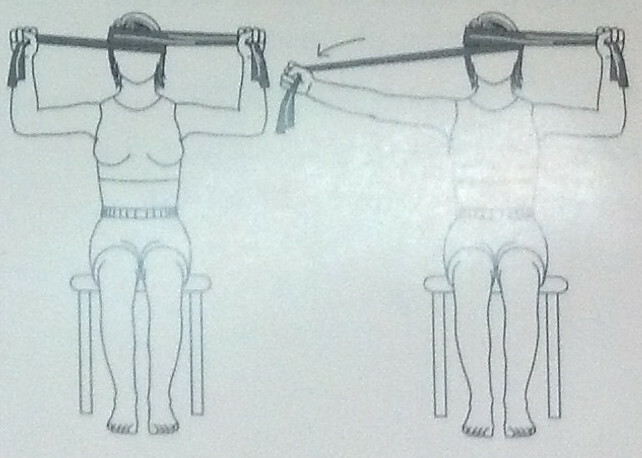 Grasp ends of band in hands with elbows bent, and hold in front of head as shown. Keep neck in a neutral position with chin slightly tucked inward. Hold head and neck steady and do not allow neck to bend. Extend elbows, stretching the band in front. 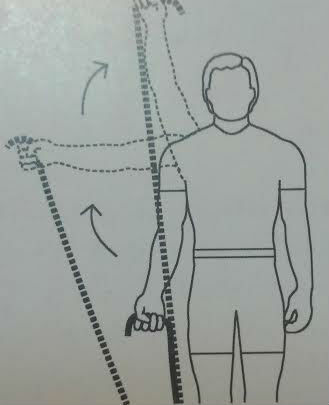 Grasp both ends of band in hand with bent elbow, to one side of head as shown. Keep neck in a neutral position with chin slightly tucked inward. Extend elbow outward to side, stretching the band away from head. Slowly return and repeat extending with other hand. Place middle of band around back of head. Cross the ends of band over forehead. Grasp ends of band at eye level near head as shown. Keep neck in a neutral position with chin slightly tucked inward. Extend one elbow outward to side, stretching the band away from head. Hold head and neck steady and do not allow to rotate. 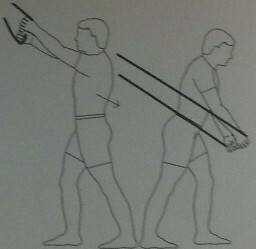 Begin with arm at side, elbow straight, holding band, palm facing forward. Raise arm upward, out to side and over head. Attach band to secure object at waist level. Pull arm inward, keeping elbow straight. Secure band to secure object at floor level. Sit or stand, arm at side. Grasp elastic in hand, palm forward. Lift arm upward and across body to opposite shoulder, bending elbow, ending with palm inward. Attach elastic to secure object at floor level. 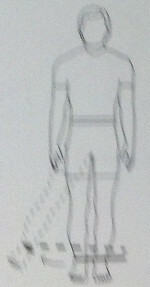 Begin with arm crossed over trunk, holding band, palm inward, at opposite hip. Raise arm up and diagonally across, ending with palm facing forward. Attach elastic to secure object as shown. Grasp elastic with hand at opposite shoulder, palm inward. 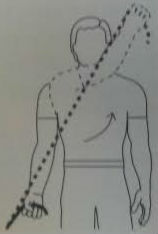 Pull arm down and across body, ending with palm outward. Attach elastic to secure object above head level. Begin with arm up and out from side as shown. End with hand at opposite hip, palm inward. Securely attach the ends of band to a stationary object near floor. 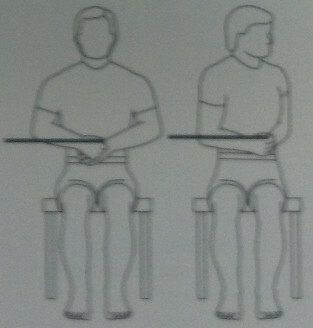 Lie on back with knees bent, holding ends of bands in hands, arms in front and elbows straight. 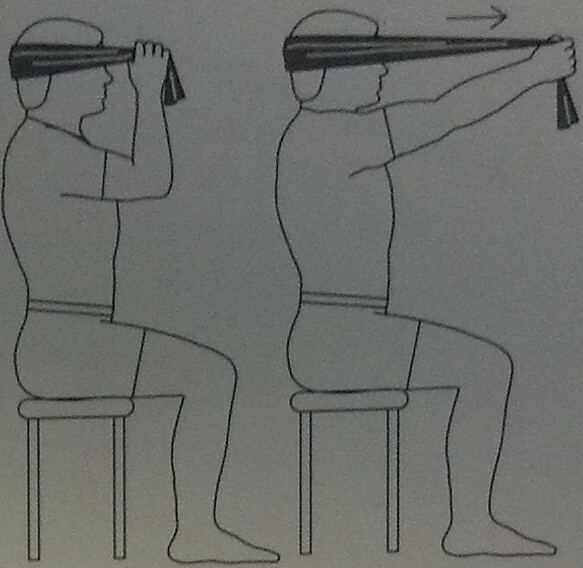 Keep hands close together and curl trunk upward, lifting shoulder blades from floor. Grasp elastic in both hands, and hold at navel. Slowly return and repeat the sets in the other direction. Attach elastic to secure object at shoulder level while sitting on stool as shown. Grasp elastic in hands and hold to chest. 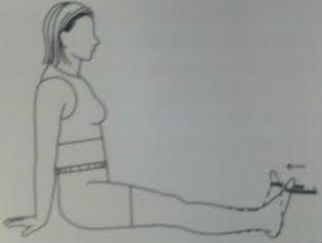 Lie on back with hips and knees flexed. Stretch band over knees and cross underneath. 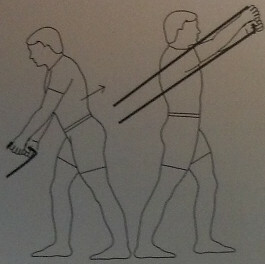 Hold each end of band in hands and place arms at sides, with elbows straight. Lift knees upward, lifting hips off the floor. 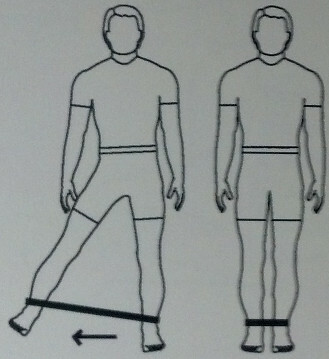 Stand, holding elastic in right hand, right foot securing other end of elastic as shown. Bend to left, keeping elbow straight. Secure elastic at floor level. Grasp elastic in both hands. 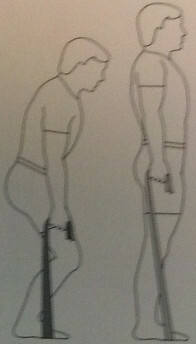 Bend at hips (knees if needed) and rotate trunk, pulling upward and across as shown, keeping back in neutral position. 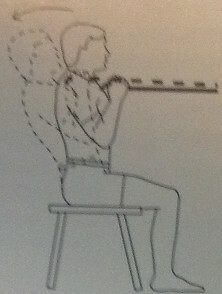 Pull downward and across, rotating trunk, bending at hips and knees as needed, but keeping back neutral, as shown. Attach elastic to secure object at ankle level. Stand, facing away from the pull. Extend leg forward, keeping knee straight. 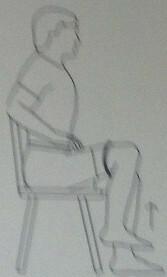 Loop elastic around thigh slightly above knee, and stabilize ends of band under opposite foot. Lift one leg up, slowly return. Stand, facing toward the pull. Extend leg backward, keeping knee straight. Stand with involved leg away as shown. Keep knee straight, pull away, moving leg outward. 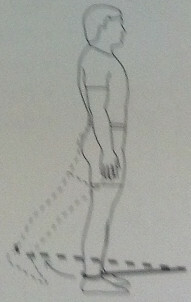 Stand with involved leg toward pull, as shown. Keep knee straight, pull in, moving leg inward. 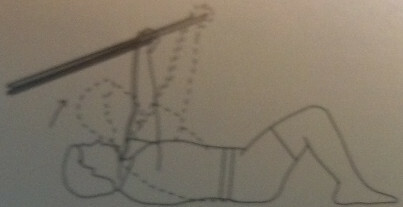 Loop elastic around ankle, positioned as shown. Lie on back propped on elbows with knees bent. Stand in middle of tubing with both feet. Squat down, grasp ends of tubing in hands and take up all slack. Keep elbows and back straight and extend hips to slowly return from the squat to an upright position. Kick leg outward and quickly repeat. Keep toes pointed straight ahead and do not bend trunk. Sit on floor or couch with leg in front. Attach elastic to secure object in front of foot. Attach other end of elastic to forefoot. 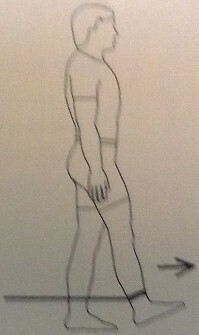 Pull foot backward toward shin.